A couple of things to talk about in this update, so I’ll just get right to it. We’ve learned today that we’re being featured by Amazon again this week, for their “Indie Game Spotlight” feature on newer Kindle Fires and the Kindle HD. Seeing as we have neither of these devices, we haven’t been able to see ourselves on the list, but that’s still great news! Thanks go to Amazon once again. We’re looking forward to the results. Since it’s free, our downloads have increased greatly. Interestingly enough, Japan has the most downloads by far (over 500 yesterday), taking us to #12 in Japan for iPhone Strategy Games, and #67 for iPhone Puzzle Games. For iPad apps in Japan, we’re #16 in Strategy, #28 in Puzzle, #127 in All Games, and #423 in Top Overall apps. Thanks for the downloads, and we hope you all enjoy the free stuffs! Thank you for the support, and happy gaming! So we’ve figured out what’s caused the giant uptick in sales. It turns out that Amazon chose Villagers Vs. Vampire as one of the games it’s promoting for Halloween. We received a nice email from Amazon that confirmed it. We’ve managed to get all the way up to #73 on the Top Paid Apps, and #60 in Top Games. The result is an average of about 100 sales per day, so far. We’re hoping we can get even higher as we get closer to the weekend and Halloween. It’s an exciting time for us! One of the benefits of multi-platform development…we would have very little sales and downloads if we had only released on iTunes. Also, in light of the recent success of V Vs V, we’ve been reassessing our next project. I was starting work on a word game, but now I may actually turn my attention to exploring deeper permutations of the path-puzzle genre. There were several ideas we had when working on V Vs. V that didn’t end up making it, and there are also many themes and implementations to explore. I’ll post more as that and other news occurs! So yesterday turned out to be quite a fantastic day for us. 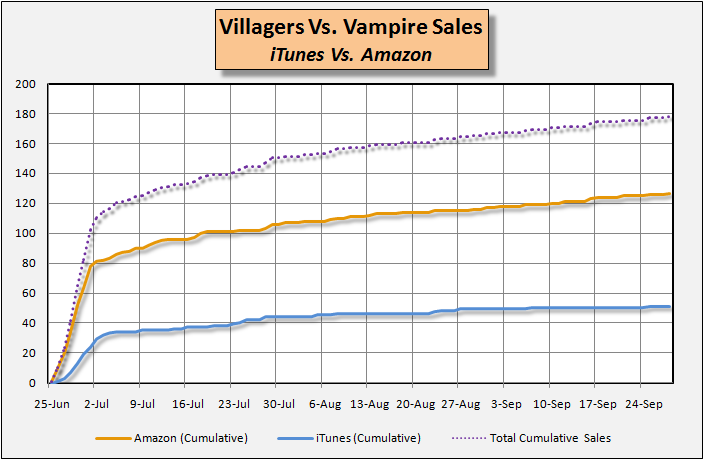 Somehow we ended up with a massive increase in sales of our full version of Villagers Vs. Vampire on Amazon. Our rank on the Top Paid list was previously around #1700 or so, but as of today we are #85! We’ve also moved to #68 in the Top Games for Android list! We’re also in the Top 300 Free Apps with our free version, as downloads have been steadily increasing for the past few weeks. Very exciting times! A hearty thanks goes out to all of you for your support! If you’ve played it, we’d love to hear a review from you, or just give us a shout. Thanks, and have a great evening. We’ll let you know when Apple also releases the new version. Enjoy! It’s been a busy September, so I apologize for not posting much. There’s been more work at the day job, including a business trip to California, and I’ve been working on the Halloween/October update for Villagers Vs. Vampire. We’re looking to be done with the update before October 1st, which is basically this weekend, and I think we’re on track. We’re adding a new difficulty mode, a level select screen, and have reworked a bunch of interface elements. We hope you fine people will like the changes! Speaking of the game, let’s have a look at some graphs and stuff! In the previous post, I mentioned the article we wrote for Games Brief, so if you haven’t read it yet, please check it out here: Platforms Move in Mysterious Ways. It goes into our downloads and sales, and the unexpected sources that our sales are coming from. Continuing that line of thought, I have some new, updated data regarding our sales. Here are our sales as of today, Sep. 29th. Fairly steady, but you can see that we have over twice the number of sales from Amazon (which is Android based) as we do from iTunes (which is iPhone/iPad). This isn’t what normally happens in the mobile game market. Developers typically experience the opposite effect. The number of downloads for our free version is much higher on Amazon than iTunes. You can see where iTunes really shot up in downloads at the beginning, right at release, but then leveled out. Amazon started to pick up a few weeks in, and has maintained a higher rate of downloads since then. The rate of downloads per day is shown in the below graph. This tells the download story directly. When the game was released on iTunes, the rate of downloads was high (well, relatively speaking), peaking at about 230 / day. It then drops off quickly, and has maintained a low level of single-to-double-digit downloads per day. The Google Play Android downloads have always maintained a low rate. Amazon, on the other hand, starts out slow but then picks up after about a week (the free version was released there during the 4th of July week). 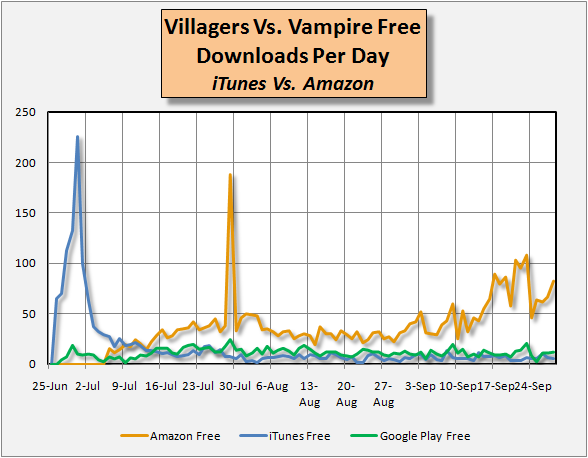 There was the unexplained spike on July 29th, but then the downloads increase again around the beginning of September. We’re guessing it’s because Halloween is coming up, and our game is in the Halloween category. We could be wrong though. We’re hoping that October will increase interest in the game, due to it’s theme and art style, and we’re looking to advertise again when we release the Halloween update. However, advertising hasn’t done much for us so far, that we can tell. We ran ads heavily at release, and in a lower capacity throughout July. See the bump in downloads we received from all the ads during that time? Yeah, neither can we. On the cusp of my favorite month of the year, in my favorite season of the year, I feel that we have a lot of accomplishments to celebrate. We started our own game company, we followed through with creating and actually releasing a full game to the public, we did it while holding down full-time jobs, we released on multiple hardware platforms at the same time, we have thousands of players, and our game has averaged 4.5 stars in the reviews we’ve received (and if you’ve played V Vs. V and haven’t reviewed us on iTunes, Amazon, or Google Play, please do so! We want to hear all of your feedback and opinions). This is just the start, and every game we write will be better than the last. Hi there! Sorry for the latent posting this month. The new job situation has slowed me down considerably. I guess it’s my extreme level of introversion, and I mean that in the Carl Jung sense, not the often-used “I’m just shy” sense. Being around groups of people all day is extremely draining to me, mentally. I come home and I just want to sit, which is doing wonders for my creativity and game development. It’s a temporary situation at the moment, but one I feel every day, and it’s very difficult to shake myself out of it. So, yeah, on to plans and stuff! I should have an article published soon, and I’ll mention it here if/when it goes up. 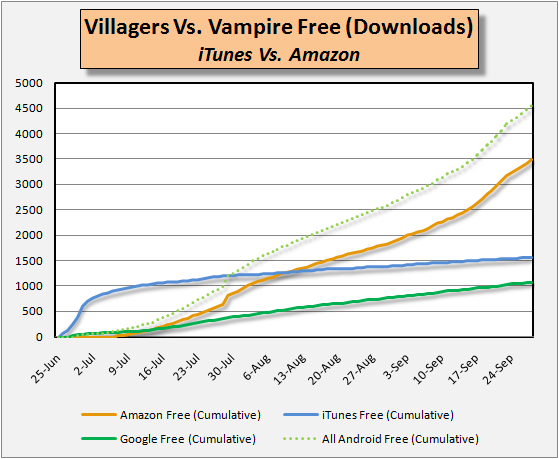 It talks about our unexpected sales experience with Villagers Vs Vampire and how the mobile environment is changing. On the game front, I’m moving like a glacier on our next project. I have a mini-prototype coded and running, but I need to flesh it out more to see if the game concept will actually be enjoyable. Also, I’m planning to make a Halloween/October update for Villagers Vs. Vampire. Given that I should do it by mid-late September for it to be available in October, I should probably get started on that! How I wish I could write games for you (and us) full time, but that remains a dream for the present.